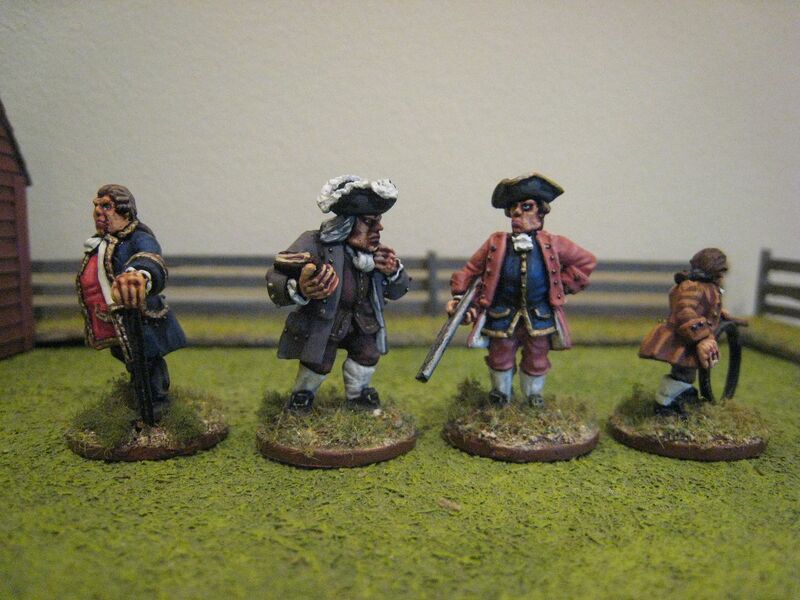 A few weeks ago I found a pack of Foundry 18th century civilians in my AWI leadpile box (actually a large Pampers nappy/diaper box) and thought I'd paint them up. I must have had this pack for years, because I recall buying a few of these civilian packs at Salute when they were brand new releases - that was some time ago. These figures are from pack CIV3, which contains 2 very smart ladies, a finely-dressed "gent" with a cane, a "notary" (as per Foundry's description), a chap who looks like a "gamekeeper" or bodyguard, and a kid with a wooden hoop. I've only painted the males at this stage, and here the are. The figures, sculpted by Rob Baker, are quite large and chunky and characteristicly square-jawed. 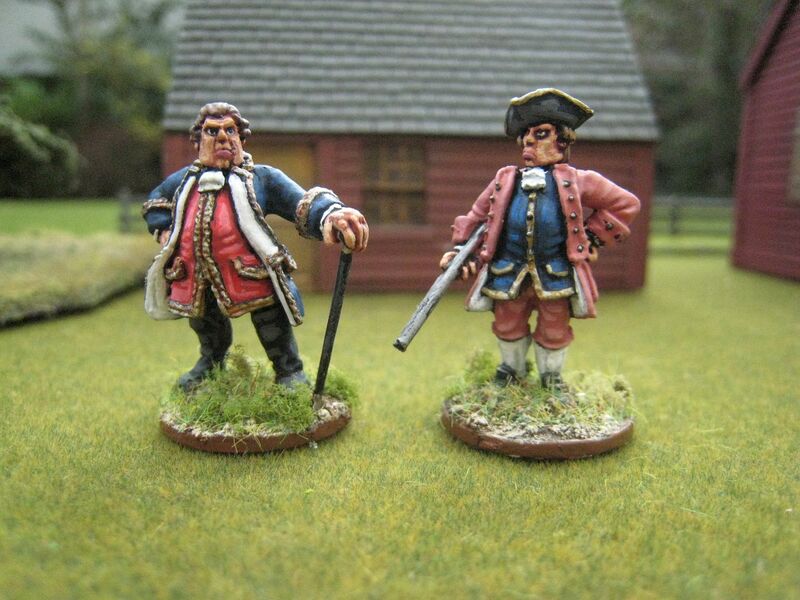 The "gamekeeper" would make a good militia officer, while the "gent" is wearing clothing that would closely resemble an admiral's uniform were it not for the large boots that he's wearing. Nonetheless, the outfit does look rather military and I these two chaps would go well together on a militia command stand. As I've mentioned in previous posts (see here, for example), when I paint civilians for the AWI I like to draw inspiration from contemporary artwork. I choose one of my various exhibition catalogues of later 18th century artists and pick out suitable "models". 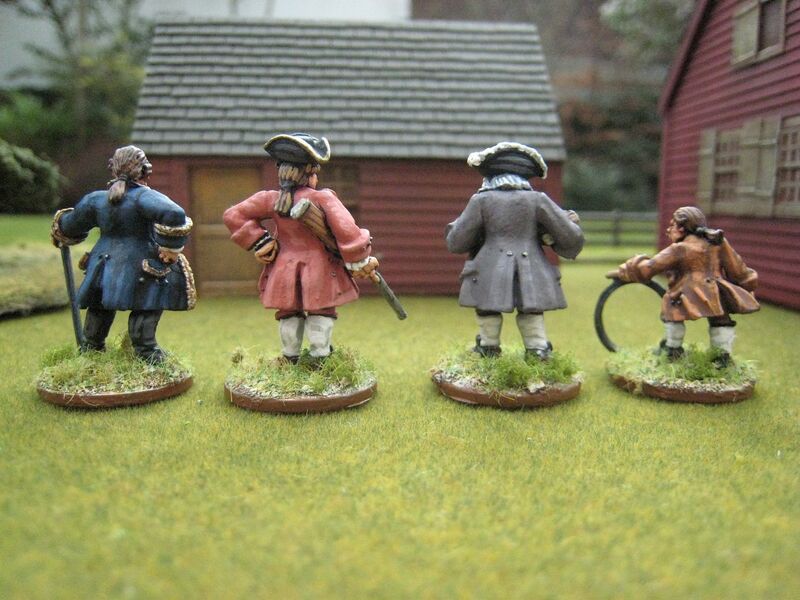 This approach only really works when painting up "aristocrats" and civilians in top-draw outfits like these figures, as surviving portraits are invariably of the well-to-do types who could afford to commission the leading artists of the day. Buut contemporary paintings do give you an idea of the fashions of the day. So I thought I'd put up pictures of the various paintings I followed for these figures. These were painted, with one exception as detailed below, by the English artist Joseph Wright, usually styled "Joseph Wright of Derby", who lived between 1734 and 1797. Wright went to Liverpool in 1768 and spent 3 years there mainly painting portraits of the local gentry and (usually slave-owning) merchants. His subjects included a certain John Tarleton, businessman and major of Liverpool in 1764, and his wife Jane; their second son joined the 1st Dragoon Guards in 1775....The book I used is the catalogue of an exhibition of the work Wright produced during his time in Liverpool. 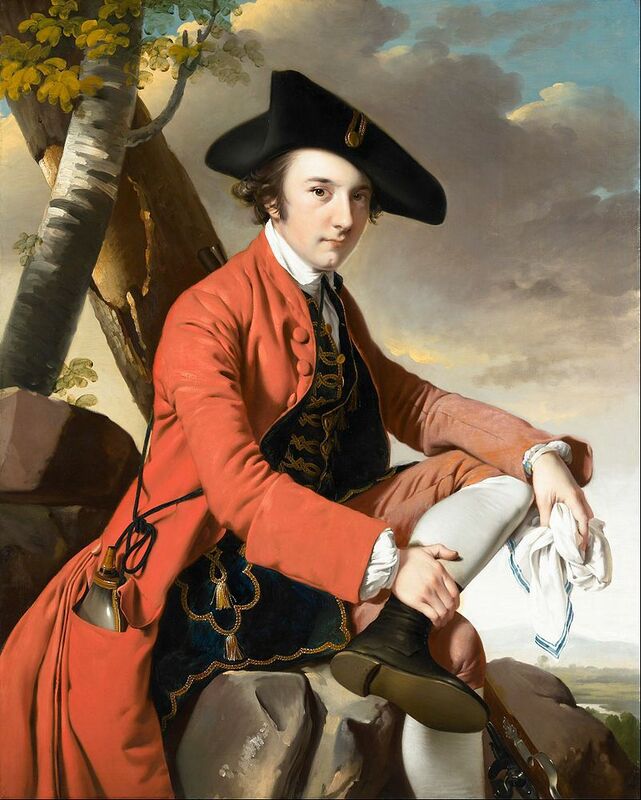 The "gamekeeper", with his madder red coat and breeches and royal blue waistcoat is modelled on Wright's portrait of Fleetwood Hesketh, dating from 1769. The Hesketh family were Lancashire landowners with business interests in Liverpool. Hesketh is shown here in his hunting outfit (complete with powder horn and gun). The "notary" is based on a 1766 portrait of Richard Gildart (1671-1770), a businessman specialising in shipping, tobacco and rock salt. He was mayor of Liverpool three times and then served as Member of Parliament for the city from 1734 to 1754. Gildart became one of the leading Liverpool slave traders, sending ships to West Africa to barter tobacco for slaves that were then shipped to the West Indies. I used the Foundry "Quagmire 63" palette for the coat. The catalogue states that at the time of painting the coat has "a slightly outmoded, deep-cuffed style", which isn't really out of place for a man who was 95 at the time of sitting. 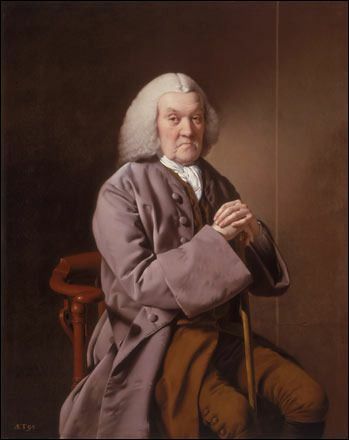 Nothing of Wright's own work jumped out at me for the "gent", but one of the introductory essays in the catalogue featured a 1755 portrait by George Stubbs of James Stanley. Stubbs is nowadays revered as a painter of horses, particularly racehorses. Nothing is known about James Stanley other than that he was a cousin of the 11th Earl of Derby, was 33 at the time of this painting, and was probably a fried of Stubbs' during the latter's childhood in Liverpool. I saw this picture and thought a dark blue coat, red waistcoat, and white lining would be suitable for the "gent". This painting is actually the earliest surviving painting by Stubbs (he was 31 at the time). He may have sensed that portraiture wasn't his forte. No "model" was used for the little boy. Hoop rolling has been a children's game since the earliest times - the ancient Greeks even turned it into an adult sport. By the 1840s it was a real problem in the streets of London and newspapers led calls for the activity to be banned. At this time many hoops were made of iron and so often caused injury to pedestrians. Maybe I should have painted the "gent" as an admiral - not quite sure how I would have used him, though. The "gamekeeper", on the other hand, may well see militia service at some stage. Four figures. Painted December 2015. This unit appears to have been formed by Charles Dabney in 1777 or 1778. 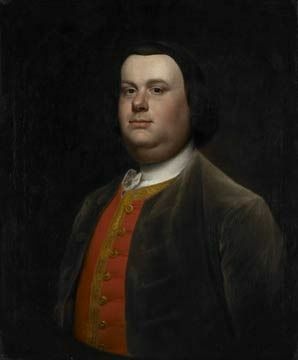 Dabney was from a prominent Virginian family and joined the patriot cause as soon as war broke out in 1775. He quickly rose through the ranks and by the end of 1776 was a major in the 3rd Virginia Continental Regiment. In 1778 he become lieutenant colonel of the 2nd Virginia and was present with that regiment at the battle of Monmouth. Later that year he appears to have transferred from the Continental Army to command of the 2nd Virginian State Regiment, although Dabney's unit served with the Continental army and Dabney fought at Stony Point in July 1779. From 1781 Dabney's regiment was part of Lafayette's force in Virginia and it saw out the siege of Yorktown. It seems that in early 1782 most, if not all, of Virginia's state troops were merged into Dabney's regiment, which was renamed Dabney's Second State Legion. The unit consisted of infantry, cavalry and artillery and became known simply as "Dabney's Legion". The Legion remained on duty in Virginia throughout 1782. Dabney must have become rather bored as apparently he tried to persuade the government to let him take his Legion off to invade Bermuda. The Legion was disbanded in April 1783. Dabney's Legion appears in only one published "British Grenadier!" scenario to date, the cavalry action at Gloucester in volume 3. This is the skirmish on 3 October 1781 primarily between Tarleton's British Legion and Lauzun's Legion, otherwise known as the "Battle of the Hook". This scenario requires a uniquely large number of cavalry figures: 36 from the British Legion, 16 Queen's Rangers, 4 Light Dragoons and 60 from Lauzun's Legion. Not many AWI gamers are going to have access to those kind of resources by themselves, I suspect. 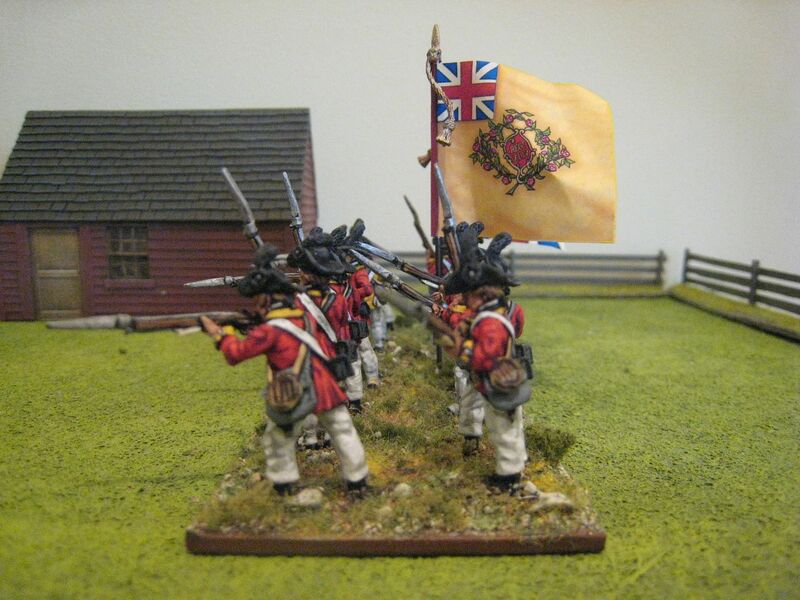 Dabney's Legion appears in the orbat as part of American reinforcements that arrive on Turn 10 (the unit is clearly cavalry, even though the battle took place in 1781 prior to the "merger"). So not only does this unit make it's sole appearance in one of the most unlikeliest of AWI games to be staged, but also it appears right at the end, if one even gets that far. So Dabney's Legion ranks high, if not at the very top, of my list of units that are unlikely ever to appear on the tabletop. Actually, I can use a couple of bases to bulk out militia cavalry units for other large-scale southern scenarios, but I'm sure you see my point. Which is a shame as I really like the look of this unit. I remembered seeing a painting by Don Troiani of an American cavalryman in a dark blue hunting shirt and a Tarleton helmet, and I knew I wanted to model a unit like that. The Osprey MAA "General Washington's Army (2)" describes the uniform of Dabney's Legion as "green sailor's jacket and blue overalls", but the illustration in the book is clearly an infantryman. Troiani's "Soldiers of the American Revolution" refers to the purchase by the Virginia government in 1782 of a consignment of "royal blue coats with blue facings" that were used for Dabney's Legion and the Illinois Regiment. 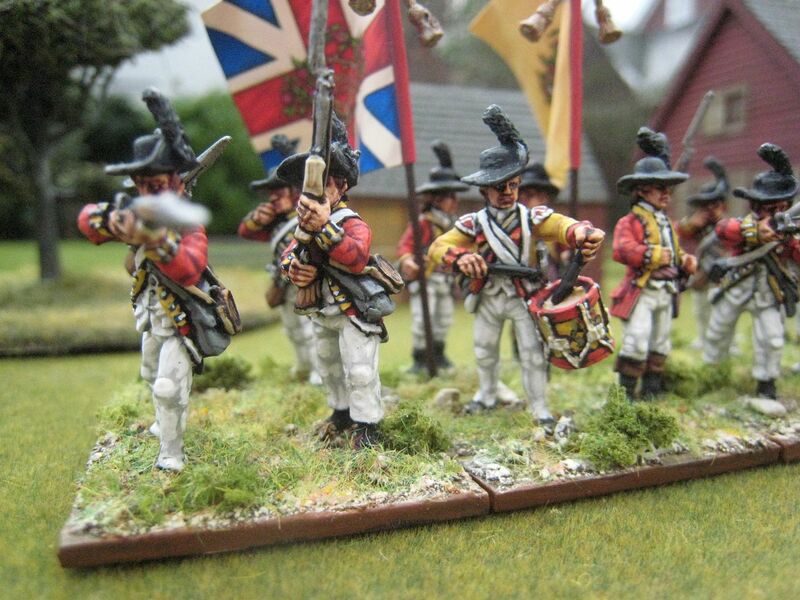 Even though that uniform may well have been worn after the Gloucester action took place, I decided to go with that and paint a unit that contained a mix of hunting shirts and coats. I kept the hunting shirts in various shades of blue, so the uniforms as a whole would all blend in. 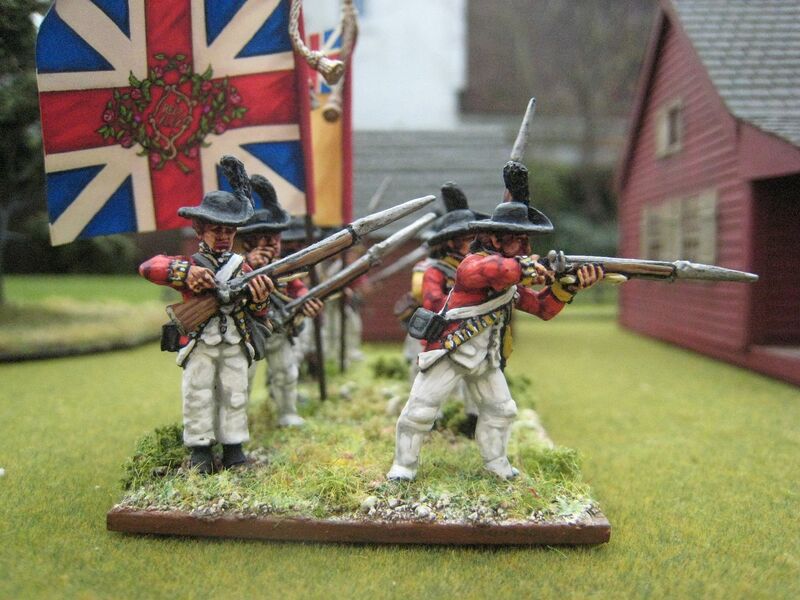 As with my other recent American and loyalist cavalry units, this one utilises the fantastic Eureka Miniatures "ragged Continentals" figures. The flag is home made; a simple design to reflect the unit's Virginian identity. 10 figures. Painted January-February 2016. The 44th was raised in 1741 (as "Long's Regiment of Foot") and fought in the '45. It then became 44th Foot and in 1782 was given the country name "East Essex". 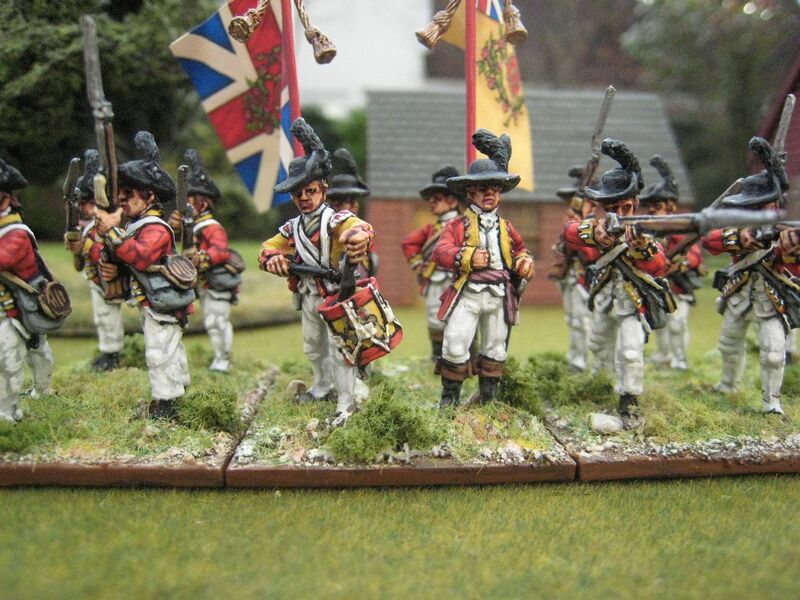 I'm not entirely sure what constitutes "East Essex" these days, but as I now live in Essex this was a regiment I have wanted to paint for a while. The 44th first visited America in 1755 and took heavy casualties during the Braddock Expedition and the battle on the Monongahela. It saw further action in the F&IW and remained stationed in Canada until 1765. After 10 years in Ireland the regiment returned to American in July 1775. As part of Howe's army, the 44th participated in the major battles of 1776-78. In 1779 it returned to Canada and finally went home to Britain in 1786. The 44th was often in the thick of things. The second battalion captured a French eagle at Salamanca and the first battalion fought in the War of 1812. The regiment made the famous "last stand" at Gandamak at the close of the disastrous First Anglo-Afghan War and then fought in all the major actions of the Crimean War. It amalgamated with the 56th (West Essex) Regiment in 1881 to become the Essex Regiment and now survives as C Company of the 1st battalion of the Royal Anglian Regiment. The 44th is quite a handy battalion to have for the AWI. It appears in the Dorchester scenario as an 18-figure unit and then as 16 figures in Long Island, Brandywine, Germantown, Whitemarsh and Monmouth. Like many battalions that fought in the AWI, it has yellow facings. 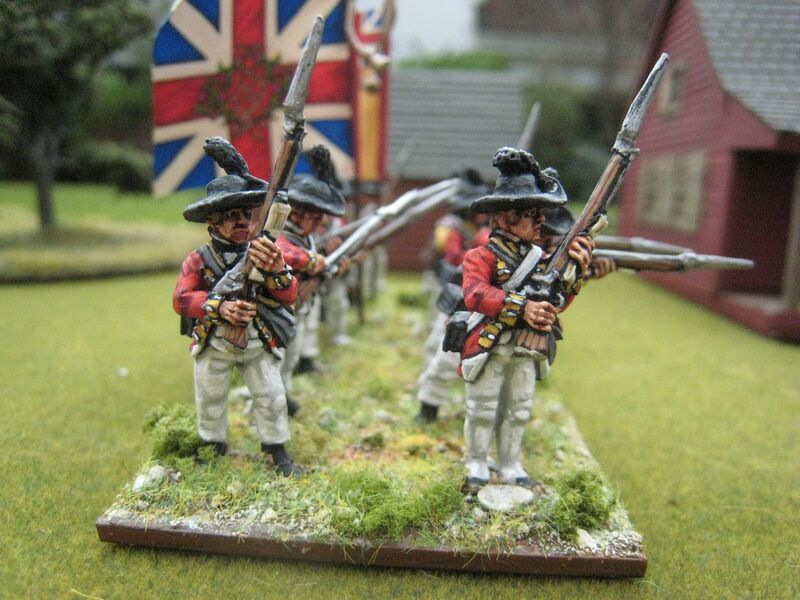 I've been rather remiss with posting at last, but I'll catch up over Easter with more civilians, some British casualties, Dabney's Virginian Legion and one or two other things. 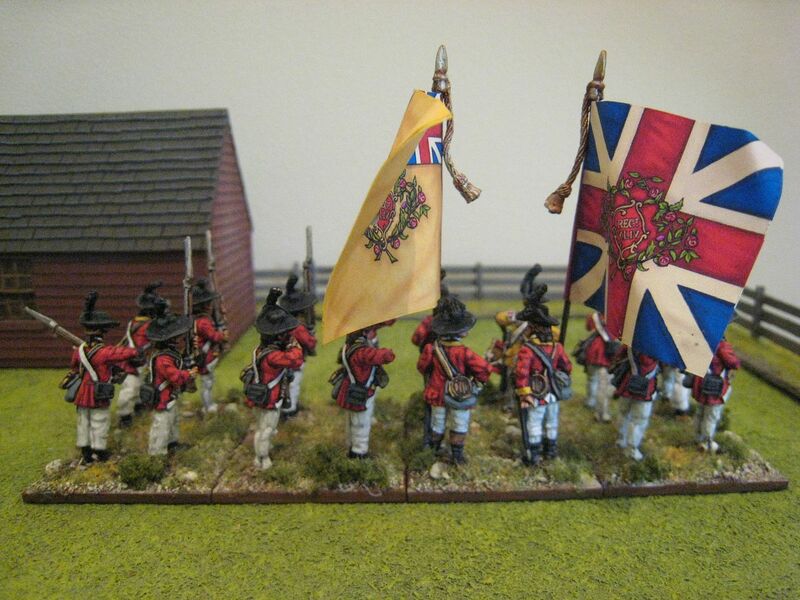 On the painting desk at the moment are Pulaski's Legion cavalry and the 46th Foot. 16 figures. Painted November-December 2015. Flags by GMB. I've been snowed under at work recently - hence the lack of posts in almost a month. But today the sun was shining, the boys were pretending to be Jedi Knights out in the garden, and I thought I'd get the troops and camera out. I've been meaning to set out the cavalry units I've put together using the Eureka Miniatures "Continental" cavalry range for a while, and I was prompted to do so today for two reasons: (1) I've just finished basing Dabney's Virginia Legion, and (2) Eureka are coming to Salute and the last day for show pre-orders is Wednesday. You don't need much cavalry for the AWI. One of the features of the period is that there are a lot of units which appear in the scenarios, but (by and large) do so only once or twice. This is particularly true of American and Loyalist cavalry. On the Patriot side, the 3rd Continental Dragoons top the list with 6 appearances (with a top strength of 8 figures), while Lee's Legion appear in 5 scenarios (with a top strength of 10). Other units have fleeting appearances, and a "southern militia" unit of 8 figures will get you through most other scenarios. But the Eureka range, with its separate hat system and its mix of figures of uniform coats and hunting shirts, can be used to model all those small units of state and militia cavalry that appear in the scenarios. 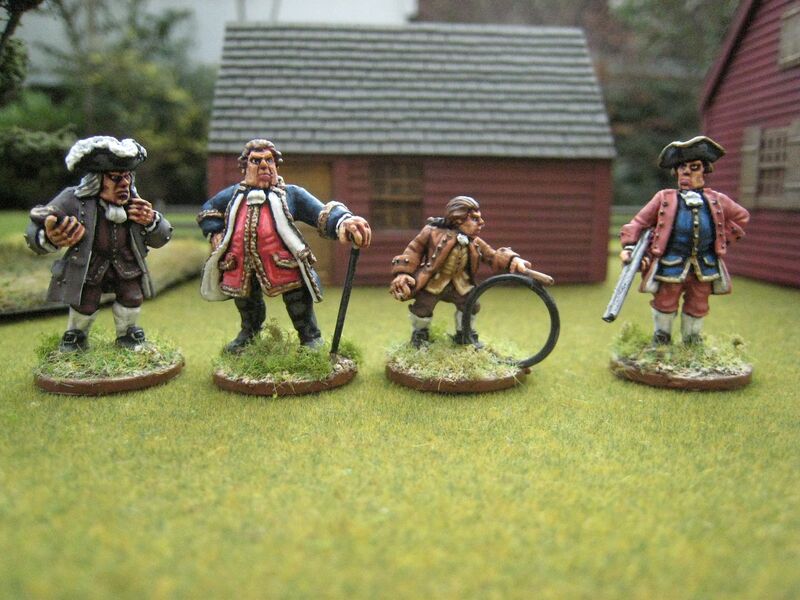 This is what I've been trying to do over the past couple of years, and have painted up some figures as Loyalists as well. So here's a chance to see them all out in the open - the individual unit entries are on the Eureka label. I bought all these figures in two batches, the first in Australia back in 2011, the second at Salute a couple of years later. I always felt guilty that having raved about these figures when first released, I then didn't really paint them as quickly as I might have done (I had over 50 of them, which seemed quite daunting). 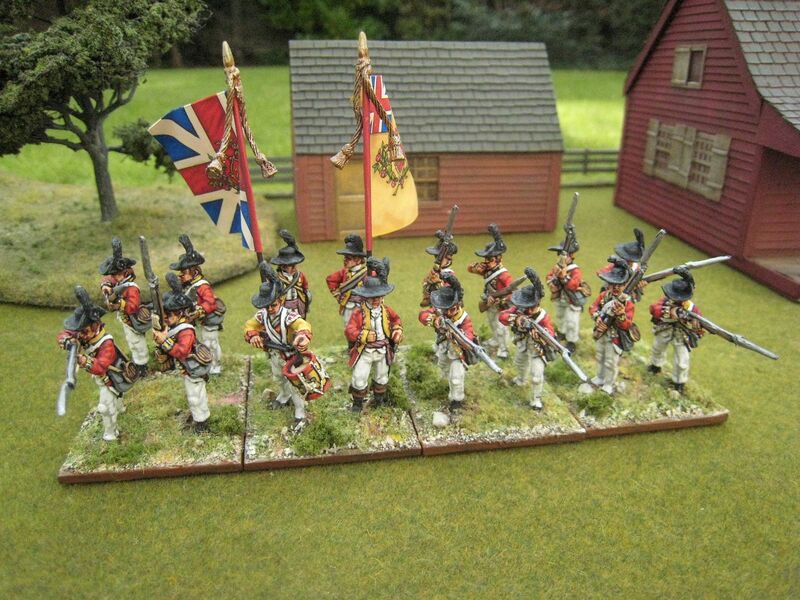 But now they are all finished and I need to buy some more to finish off Pulaski's Legion and more southern militia. I love these figures and can't recommend them too highly. A trio of hand-made flags. Dabney's Virginians, on the left, will be in a future post.